Audi Sport debuted its redesigned Audi R18 for the 2016 race season on Saturday, and the new car will take over as the manufacturer’s FIA World Endurance Championship entry—but the team will only field two cars total. Despite the new R18, both Audi and sister company Porsche will drop from three entries to two in the 24 Hours of Le Mans next year as a means of “maximum cost efficiency” in the midst of Dieselgate. The R18 will feature a modified hybrid system with lithium-ion batteries and a TDI engine, and the team will cap its WEC championship enteries at two throughout next season as well. Motorsport.com reports that Audi will keep its full-time driver lineup for the series, meaning that only the championship contenders will have an opportunity to compete in the 24 Hours next year. As for the returning team lineups, the No. 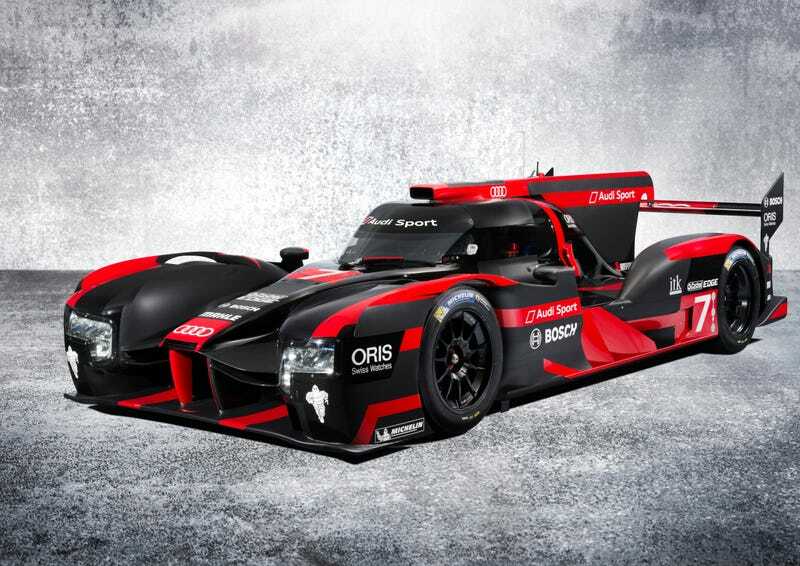 7 Audi will be piloted by Andre Lotterer, Benoit Treluyer and Marcel Fassler while Loic Duval, Lucas di Grassi and Oliver Jarvis return to the No. 8 car. The series wrapped up its championship with a Porsche on top this year, while the No. 7 team finished second in the standings and the No. 8 group ended up fourth overall.